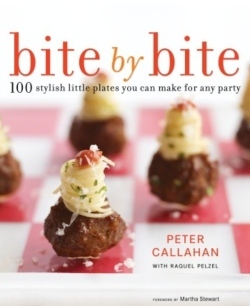 Peter Callahan recently published a book of appetizers called "Bite by Bite." Glossy and full of amazing ideas for small bites at any sort of party you could throw, this one recipe struck me as something you could also adapt for small kids. I think they would be great for a kid's party where little ones are more likely to nibble than eat large amounts, and you could swap the yogurt flavors and fruit to whatever suits you best. I think using lemon yogurt and raspberries could be a hit as well.They won't tuck into a lunchbox well, likely falling apart as they are jostled around, but I can assure you that they were so delicious that after taking the photos I ate three. Grease two mini muffin tins with butter, or spray them with non stick spray. If you only have 1 mini muffin tin, I suggest you half the recipe and make it twice because otherwise it won't work for you. In a small sauce pan over medium low heat, melt the butter. Add the marshmallows, and stand and stir until they are fully melted and smooth. You can't really walk away from this, they could burn and make a big mess-which you would really never want. When the marshmallows are melted and smooth, take the pot off the heat and stir in the cereal until it's well coated. Quickly spoon 1 tsp of rice krispie mixture into each muffin cup, molding them to the cup with your fingers so you have little cups to fill with yogurt. It works best if you rub some butter on your hands first, and that way the mixture won't stick to you. Be quick, here because the longer the mixture sits in the pot it's going to harden up and be hard to work with. Let the cups harden up-about 5 minutes or so, before you fill them with a little yogurt and top with fruit. If you like, you can also store the cups in an airtight container for up to 2 days. Filled cups do not keep well, they will be soggy the next day.